– Feature Article: Is it Cheating? “I enjoyed your last newsletter on last minute weight ideas from the hardware store. I’ve built a few cars using some of the ideas you shared about using nuts and bolts. Here is one of them, “The Craftsman”. 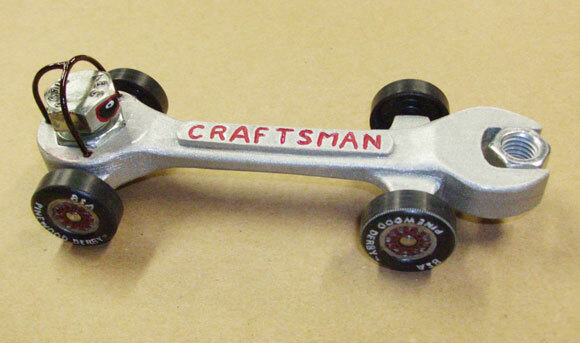 Here’s one that is probably not the most traditional way of weighting a pinewood derby car: “The Pipe Wrench”. – Quality Block – Unlike the blocks provided by some organizations, our blocks are soft, northwestern pine blocks, cut precisely to 7 inches long, 1-3/4 inches wide, and 1-1/4 inches tall. 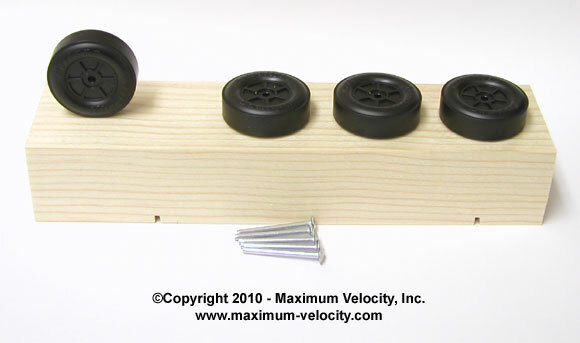 These dimensions, as well as the axle slots accurately duplicate the dimensions of standard pinewood derby blocks from BSA and PineCar. – Simple Axle Preparation – Don’t worry about filing off flaws, or losing hub caps. Our Speed Axles have no burrs or crimp marks, and install without hub caps. With or without polishing, they are ready to go. We supply five, so you have a spare. – Quality Wheels – Forget cheap, out of round wheels. Our MV wheels are top-quality wheels. You will not be disappointed with the quality of these wheels. So, if your organization does not mandate a particular kit type, consider our MV Basic Car Kits or MV Wedge Car Kits. We also offer bulk packs of MV kits in Pre-cut Shapes. We don’t have many remaining, so don’t delay.You can find these items Here. If we can help you in any way with your pinewood derby project, or if you have any feedback regarding this newsletter, please Contact Us. This past year I received several e-mails relating situations where car builders were accused of cheating. In some cases, the writer of the e-mail was certain that another parent had cheated, and in other cases the writer was accused of cheating. In several of these cases, I disagreed with the accusation. I am certainly against cheating, but before an accusation of cheating can stand, there must be an understanding of the definition. The car owner must knowingly violate a particular rule. This may seem like a narrow view to some, but let me share some situations that will (hopefully) make this clearer. “Our pack had no printed rules other than those in the BSA kit. In addition, I was told by the pack leaders that the only rules were 7 inches long, 5 ounces maximum weight, and 3/8-inch ground clearance minimum. So, we put the car together and complied with these rules. We did use axle holes (instead of slots) and had a three wheel on the ground setup. When the car was inspected at the race, the inspector said we should have used the slots on the bottom of the car so that the axles could be seen. This was the first we had heard of this rule. After a brief discussion with the officials we were allowed to race (our car, built in 2 days, was one of the shabbiest looking entered in the derby). What happened here? Did the car owner cheat? Did the previous champion have a valid issue? Were the race officials justified in their actions? In my opinion, the car owner followed the rules (there is no mention of axle holes or slots in the ‘Rules’ section of the paper in the BSA kit), the previous champion had no valid issue, and the officials should be ashamed of themselves for changing their previous ruling during the middle of the race. Did cheating occur in this situation? The car evidently met the rules and was allowed to race with no issue. The victory was not due to a rule violation but was due to the amount of time and effort put in by the parent/child team. (2) Clearly, the accusations had no merit and were just due to “sour grapes” on the part of the race official. What a display of childishness. I could go on, but I believe the point is made. A different interpretation of a vague rule does not constitute cheating. Was this cheating? Apparently, the long wheelbase car was acceptable at the pack race so there was no cheating at that event. Since the car violated the district rules, it was rightfully disqualified. Since the car never raced at the district, the car owner certainly couldn’t be accused of cheating. Too bad that the district and pack rules were not synched up. The rule violation was hidden, but somehow became known during the race. Let me provide an example for each. These situations do arise, so officials should be prepared with a response. The rules specify that no moving parts are allowed except for the wheels. During a heat, a car crashes and mercury comes spilling out (this actually occurred in early 2004 at a BSA race in Kansas). Was this cheating? In case 1, in the highest likelihood the violation was unintentional. 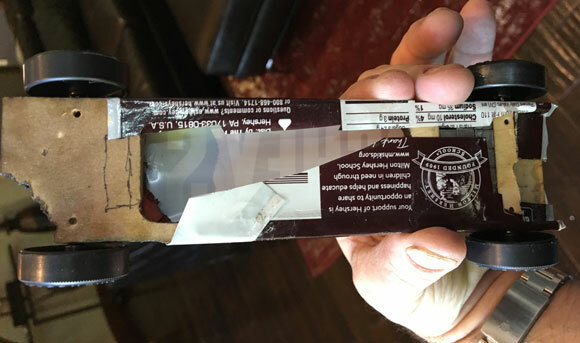 The owners would have had every reason to believe that the violation would be detected at the inspection, so to intentionally attempt the illegal technique would have been pure foolishness. What should be done when the illegality was detected in the race? In my opinion, since the car passed inspection and was allowed to race, no action should be taken. The car should be allowed to continue racing. The pack should make sure to improve their car inspection check list before the next derby event. In case 2, cheating may or may not have occurred. It is possible that the parent did not consider mercury a “moving part”, and equally as possible that the parent knew, but gambled that it would not be detected (of course in either case, the parent showed highly questionable thinking by using a toxic substance in the car). Since the rules specified no moving parts, and since the detection of the mercury would have been virtually impossible at inspection, I recommend disqualifying the car. The situation would be the same if during the race a wheel came off and it was found that a hidden bearing or bushing was used, or that illegal axles were used. Clearly, this is a gray area, so to avoid problems and legislating from the bench, set a policy ahead of time as to how to respond to illegalities found after inspection. Certainly, cheating does occur. But to avoid false accusations make sure there are clear rules in place, and there is a clear intent to violate a rule. 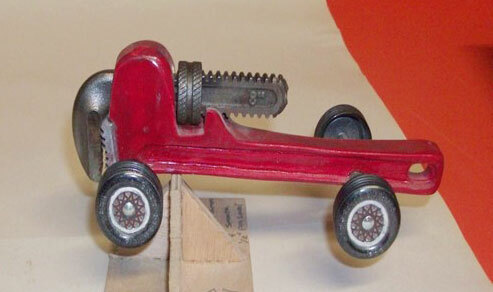 Remember also that pinewood derby racing is a child-oriented activity. Parents, keep it fun by avoiding unnecessary conflict. (1) The car ended up taking 2nd Place in the pack. (2) Consistent winners are oftentimes accused of cheating, especially if their car is significantly faster than other cars. While it is possible that some illegal technique is being used, more likely they know all the speed techniques, are taking every possible advantage offered by the rules, and put a lot of time into constructing the car. Working smart and working hard generally pay off (See the “Pinewood Derby Memory” in this newsletter). (3) The night before I wrote this article I helped at a local race. The rules specified using the wheels that came with the distributed kit (MV wheels), but someone showed up with a car that had PineCar wheels. The inspector didn’t catch the wheel difference and the car passed inspection. I spotted the wheels just before the race and mentioned it to the race leader. But we agreed at that point to let the car run. My dad makes the best spaghetti in the world, and my Mom eats a lot. Moms work at work and work at home and dads just go to work at work. Say “Goodbye” to burrs and crimp marks! 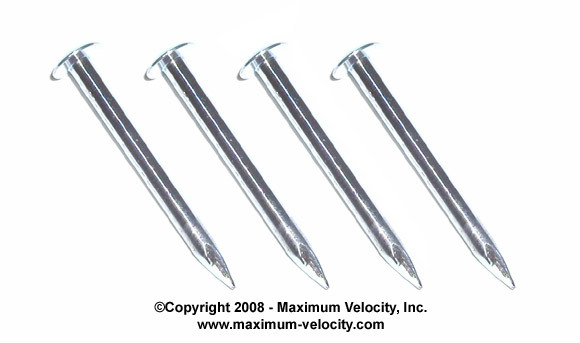 These BSA Pinewood Derby Speed Axles are precision-made to replicate the official BSA nail, but without the burrs and crimp marks. Shaft has a shiny plated surface. You can use the axles as is, or polish them with our Axle Polishing Kit or with our Axle Polish. But through November 27, 2018, you can get one set of BSA Speed Axles for one cent. To take advantage of this limited time offer, a set of BSA Speed Axles to your shopping cart and use coupon code NOV14NL during checkout. My wife and I are both Awana leaders, and we make cars every year. My car was based on the War Rig from Mad Max Fury Road – which I have not seen but has loads of cool cars. The cab is wood sheeted with styrene and wheels are mounted on a styrene sheet suspension. It ran surprisingly well given the high center of gravity and general heavy design. 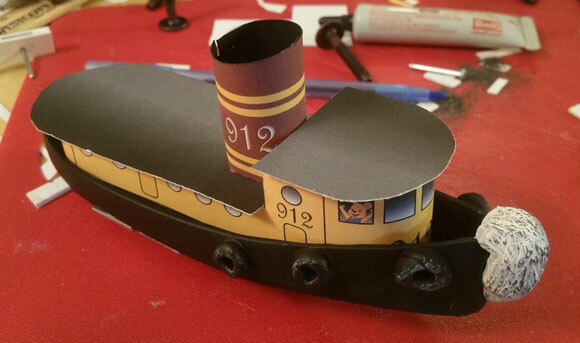 Our Awana track is extruded aluminum (hollow lane guides) which enabled my wife to make this tugboat. The wheels are inside the car, mounted on a sheet-plastic keel. The car ran okay, but it was mainly built as a proof of concept car. 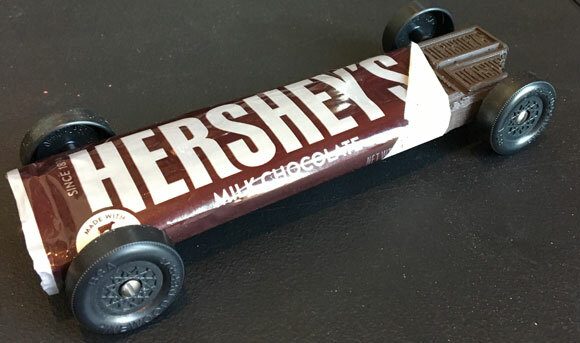 For my son’s pack race, we built a Hershey bar. My son loves those. We used a 3D printer to print out a fake bar and then used a Dremel to just use the top half of the plastic model. 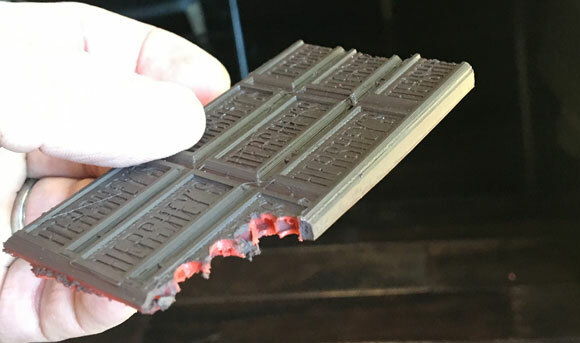 The plastic was very light – much lighter than real chocolate! I used a basic 1/4-inch wood plank with weight pockets. I hollowed out the middle to lighten the car further. In addition to the tungsten weights you see, I put a full ounce of Tungsten Putty on top (like a canopy weight) so the wrapper had an arc. We were going for most creative AND speed this year. It is “engineered” to win but my Wolf Scout and I are not great woodworking craftsmen. Please include your full name. If selected, we will include the photo and description in this newsletter. For better focus, keep the camera four or five feet away from the car, and then use the camera’s zoom to fill the frame with the car. Also, use a solid (preferably white) background for the photo. Send only one photo per car, unless an additional photo is needed to adequately show a feature. Also, only one car per subscriber per year please. Thanks. We just completed our pack’s pinewood derby last weekend. My son and I have been building cars for several years. Each attempt was better than the previous one, but still we had always come up as an also ran. This year we dedicated ourselves to having the fastest car at the race. After all, this was his last year for Cub Scouts, so it was do or die! We purchased several products: the Pro-Wheel Mandrel, Pro-Hub Tool, Pro-Outer Hub Shaver, and Axle Polishing Kit. With the tools and supplies we had acquired in previous years we had a full suite of tools. How to use all this? Well to be serious you need some decent test equipment. My son and I built our own one lane test track. While it wasn’t the smoothest and most precise track on earth it did provide for some good testing. I outfitted the track with a timer system I built around a hand stop watch. The watch was good to .001 seconds and was one of the more expensive items ($20.00). I wired in a start switch and rigged up an optical sensor with interface electronics to record the car as it went through the finish lane. It all wired into the start/stop switch in the watch! Remarkably the whole track and timer cost us under $50.00 to build. The test track allowed us to test wheel combinations, axles, lube types, car center of gravity, etc. 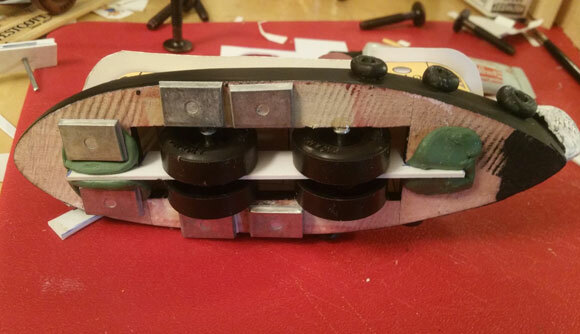 We spent almost a week optimizing the final wheel, axle, and weight distribution in our car! My wife was about ready to kill both of us as all we talked about was Pinewood Derby! Race day came, and we passed all the technical checks. Yet we were a bit hesitant to let go of the car! I talked to my son several times about not getting disappointed if we were not the fastest. What was important is that we worked together and had a fun time building and testing the car. Well when it was finally time for the races we were both fairly nervous. The first race pitted us in lane one and next to us was one of the known fastest father/son teams from previous years. As soon as the start lever was flipped I could tell we were going to do well. The car rolled true and steady as it slowly pulled away from the other three lanes, beating the nearest car by a full car length. All four runs were the same way. When all was said and done not only did we win the overall race, but we set the track record. We were the only car to combine four runs on the 28-foot track in under 9 seconds. The look on my son’s face was priceless. I was shocked and could hardly believe it. The track has seen hundreds of cars and several years’ worth of races, so you can imagine our surprise. But when all was said and done, the most important thing in my mind was the lessons we learned. I was able to teach my son that hard work and effort can and does work nearly every time! 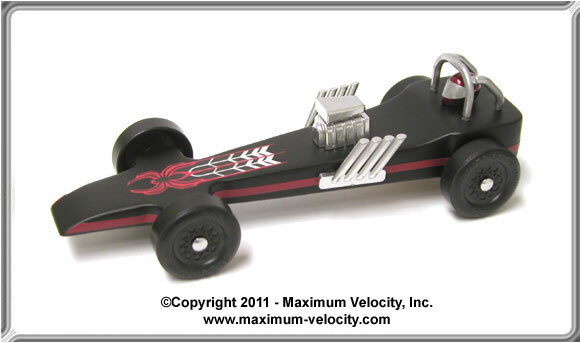 If you have a pinewood derby story that is funny, unusual, sad, heart-warming, etc., please send it to me in an e-mail. Don’t worry about literary polish. We will edit as needed before publishing. If your story is used, you will receive a $10 coupon in May of 2019. Can the 5149 Pro-Axle Guide be used to insert bent/canted axles in axle slots? What about axle holes? Yes, you can use the Pro-Axle Guide to insert bent axles in axle slots. However, it is best to use the tool to insert a spare axle into a slot position, remove it with a pair of pliers, then repeat for the other three positions. Then when you install the bent axles, they will go in without excessive effort. For axle holes, you just need a Gap Gauge; but if you already have a Pro-Axle Guide, just flip it over and hold the flat side to the bottom of the car. Again, pre-insert a spare axle, twist and pull to remove it, then insert the bent axle. 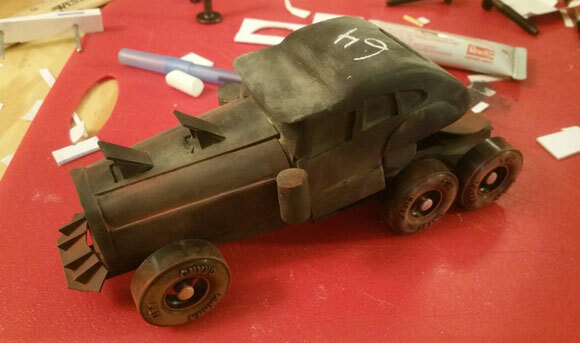 What grits of sandpaper would you recommend for sanding the car body before painting? I have read different things, but I was wondering what your opinion was. I recommend using 60, 120, 220, and then 400 grit paper before painting. Are you a new subscriber, or have you missed some of the previous newsletters? Don’t miss out; all of the issues for Volume 5 through Volume 18 are posted on our web site.